We spent a good amount of time on the bus today after we left Bacharach for Rothenberg Germany. By the way, Rothenberg is pronounced as Wrote-in-borg. 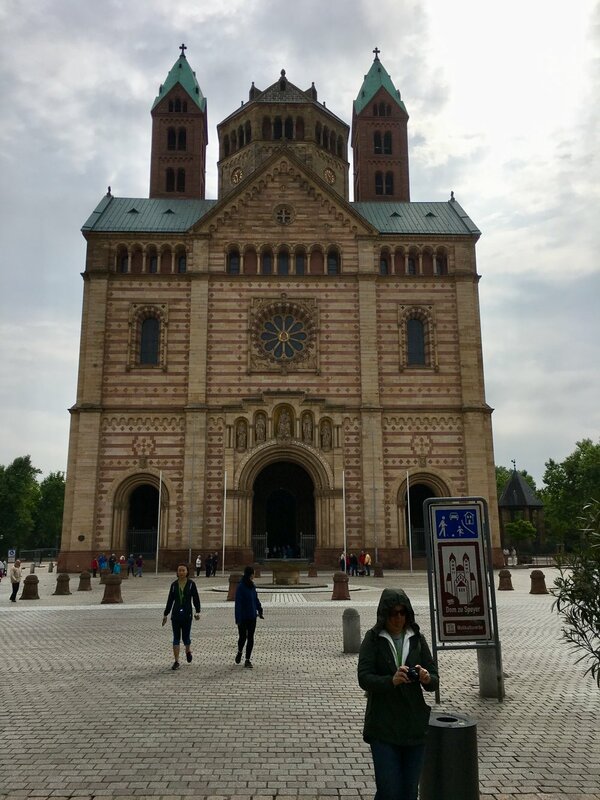 We did make a short stop in Speyer Germany. Speyer (pronounced Spire) is where the conflict between Pope Gregory and King Henry IV occurred centuries ago. There is a very large Romanesque church there along with a wide, pedestrian friendly street running from the church through the town. We got a quick lunch here before heading back to the bus to continue our ride to Rothenberg. 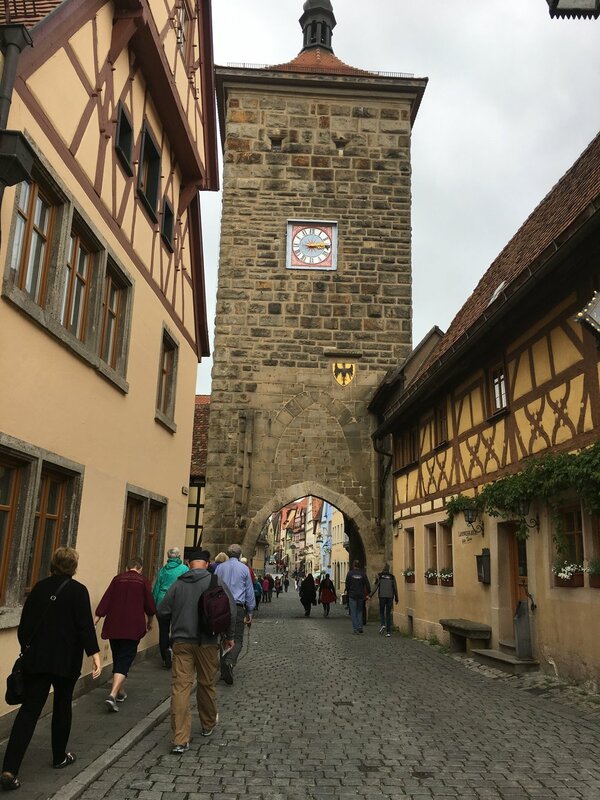 We arrived in Rothenberg early in the afternoon on Thursday and had a few hours to explore the town before our evening meal. There are a number of towers around the town, including the one in the photo below. One of the things we noticed especially about Rothenberg was how clean the town was. There was no loose litter blowing around the streets, no overflowing trashcans, no graffiti that I can remember seeing on any of the buildings. Just a very nice and clean little town. As with all of the other small towns we've been through, the old cobblestone streets see some small (or greater) amounts of traffic. But the traffic is not always bicycles and automobiles. Occasionally you see some tractor or construction machinery moving through as in the image below. There were a number of sites to see in the old city including a huge Christmas store, some beautiful gardens, the town square, and St. Jacobs church. 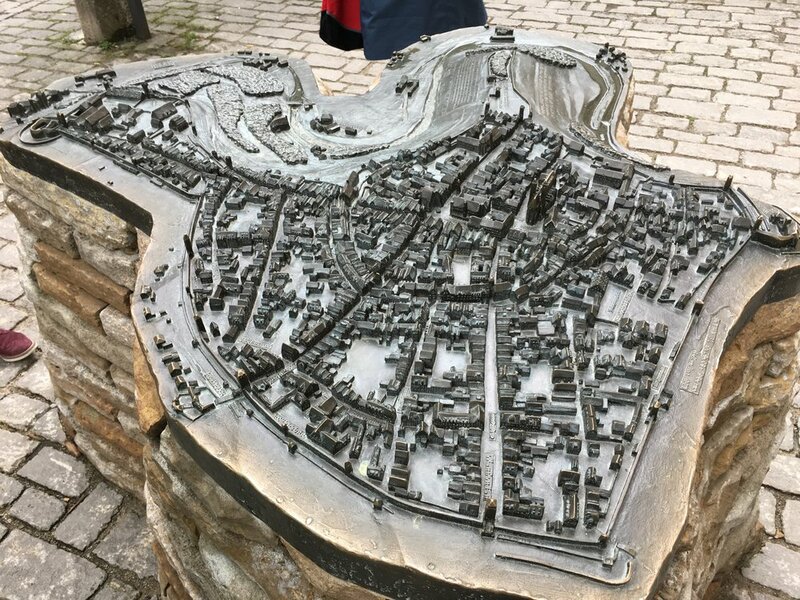 The image below shows a metal model of the town which was made centuries ago. In the church there was very little signage describing the things one would see there. In the photo below, you can see the huge pipes of the pipe organ at the back of the church. Many of the buildings in Rothenberg look like you'd expect to see them, with the large visible timbers used to construct them. Below is a public water fountain. It is so interesting to see the ingenuity of the people who lived here so long ago. 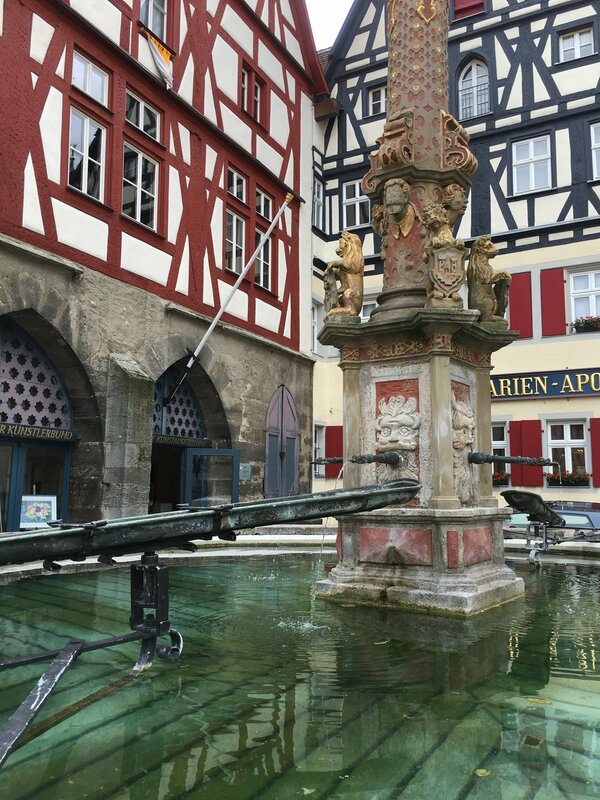 The water in this fountain can be caught in a movable metal trough and directed out from the middle of the fountain to run over the edge and drop into your strategically placed bucket. The Night Watchman is easily the most popular man in Rothenberg today. He takes people on a one hour walking tour of the city at 8PM. He stopped about six or seven times and gave lectures on various topics of importance to the old city. His talks were factual, but delivered in a "dead-pan" way that you'd expect to see from an English comedy. He was very funny at times, but effectively communicated with his followers about the plague, powerful people in the town, and the saving of the town from American bombers in the last century. One of the stops on the night Watchman's tour was in one of the towers along the old city wall. He pointed out the "manhole", a small door in the large wooden door which closed off entrance to the city at night. People who were late returning to the city had to pay large fines for the gateman to open the manhole to allow them re-entry after the gate had been closed for the day. The night Watchman was able to paint a very vivid word picture of how such interactions may have gone! 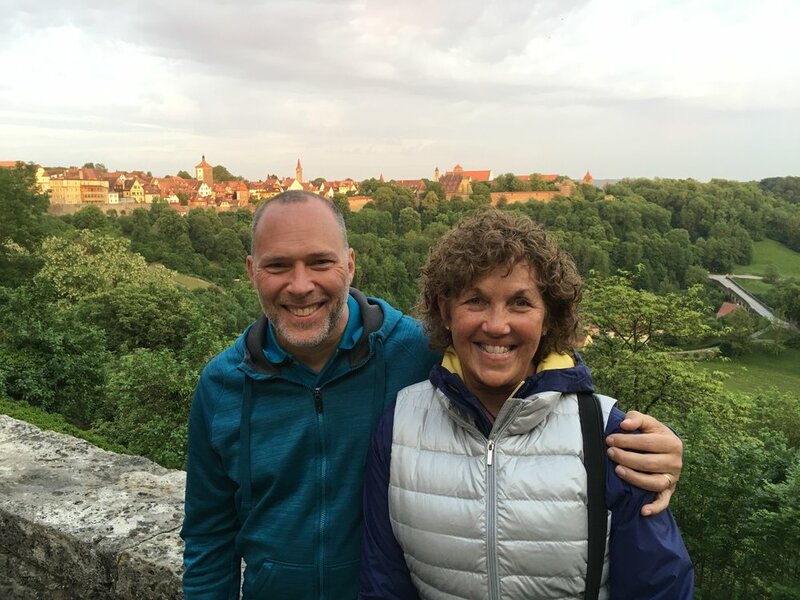 This beautiful view was at the next stop on the night Watchman's tour (I mean the scenery behind those two people who got in the way of the camera). 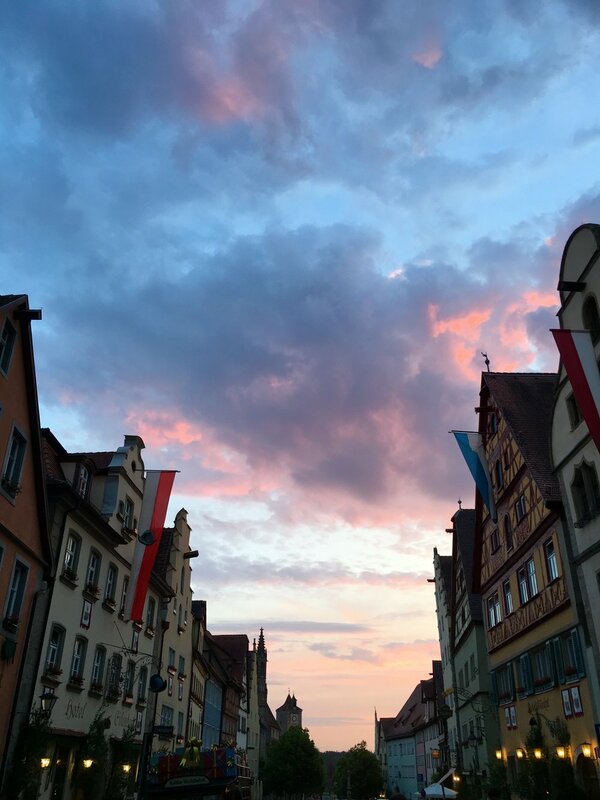 Just as the tour was ending at 9PM, a few sprinkles of rain came down on us, but the sending clouds made such a beautiful sky over this great old city. And then it was time for a walk back to our hotel for the night.